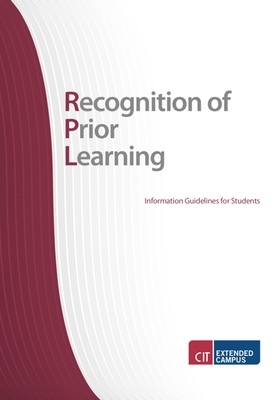 RPL is a process whereby formal recognition can be given for prior learning regardless of where or how it was gained. Prior certified learning: This is accredited learning which has taken place within another Higher Education Institution. The work was formally assessed and results and certificate was issued. This prior certificated learning need not have occurred in CIT but any other academic institution globally. If the award has been issued outside of Ireland then confirmation will have to be sought as to its equivalence on the Irish National Framework of Qualifications. Prior non-certified learning: This is learning which has occurred in a planned or unplanned way which did not result in any formal award or certification. Learning included under this classification includes informal learning, learning through life experiences and non formal learning which includes on the job training. The assessment of prior learning will be done against the module learning outcomes for which recognition is being sought. A learner must show they have all the learning outcomes previously achieved and not a percentage of them. Advanced entry to a programme at a stage other than first year based on learning equivalent to the prior stage of entry. Discuss the basis of your case with staff on the programme to determine the sufficiency and appropriateness of your prior learning. Have you prior formal learning? Have you previously completed a certified course on a bona fide higher educational institution? Is it experiential learning? Do you have substantial learning from the workplace or life experience? Is it a combination of both types of learning? Please note: where transcript of results are used as evidence of learning, then originals must be presented for verification purposes and a photocopy must be submitted with the application form. If the above is not available in English then it must be translated and stamped by an official translation service. The onus is on each applicant to ensure that the information they submit is accurate. If the academic learning has been achieved outside of Ireland it is necessary to confirm that it was at the appropriate academic level (go to info@qualrec.ie). What is Advanced Entry? Why is it Relevant? Advanced entry is entry onto a programme beyond year one. This relates to those who do not have the prerequisite level 7 qualification. Interview with Head of Department (and/or members of Course Board/Course Co-ordinator) followed by documenting case for entry. The Head of Department may interview a candidate and subsequently have a decision for entry ratified by the Registrar. Following interview the candidate may be requested to provide documentary evidence to support his/her claim. This is normally supplied in a learning portfolio outlining his/her case against each of the module areas of the stage immediately prior to that for which entry is sought. This template is available in CIT (contact phil.oleary@cit.ie (+353 21 4335133). Other assessment processes as deemed necessary by Head of Department (and/or members of Course Board/Course Co-ordinator). Depending on the stream of learning and the level of entry sought the Head of Department and course co-ordinator may request a demonstration of knowledge, skills and competence as part of the assessment of the candidate as appropriate. Recognises certified learning and learning gained at work formally. Offers an alternative route to those with appropriate experience. Compares your learning directly with the learning outcomes of a module. Provides assistance with preparing the portfolio. Frees up study time for other topics. Ensures your case is formally assessed by the academic lecturer responsible for the module. For cases based on prior academic learning the full module fee is initially payable. You are signaling your intention to be assessed for the module. Once the application has been assessed and the outcome successful, an examination fee is held and the difference is refunded after the module exam board meeting. Full module fee is payable for all other cases (i.e. experiential or combination).